Africa, the second most populous continent with the fastest growing population on the globe faces complex and integrated human security threats. From a broader perspective, human security is far more than the absence of violent conflict. It encompasses respect for human rights, good governance, access to education and health care and ensuring that each individual has opportunities and choices to fulfill his or her potential. In Africa, addressing these issues requires alleviating poverty, promoting economic growth, freedom from fear and access to a healthy natural environment as well as and preventing conflict. Characteristically, Africa is associated with war, poverty, genocide, diseases and grievous abuses of human rights, prolonged armed conflicts and rising terrorist activities. Conventionally, the African Union has adopted several instruments to deal with these peace and security threats. This article focuses on increased armed conflicts and terrorist activities on the continent. Remarkably, article 3(f) of the AU Constitutive Act seeks to promote peace, security and stability on the continent. To make this a reality, the Protocol relating to the Establishment of the Peace and Security Council (PSC) of the AU (PSC Protocol) was adopted on 10 July 2002 and entered into force on 26 December 2003. This is the African prototype of the United Nations Security Council. Article 3(a) of the PSC Protocol mandates the PSC to promote peace, security and stability in Africa to guarantee the protection and preservation of life and property, the well-being of the African people and the environment as well as the creation conditions suitable for sustainable development. Also, article 3(d) obliges the PSC to coordinate and harmonise continental efforts in the prevention and combating of international terrorism in all aspects. Article 4(j) empowers the AU to intervene in a member state pursuant to a decision of the Assembly in respect of grave circumstances such as war crimes, genocide and crimes against humanity in accordance with article 4(h) of the Constitutive Act. In addition, article 7(1) mandates the PSC to ensure the implementation of the OAU Convention on the Prevention and Combating of Terrorism and other relevant international and regional instruments. To achieve these ideals, the AU, as well as regional heavyweights like South Africa and Nigeria should champion the peace and security agenda on the continent. They should not mind their own businesses. The Boko Haram crises in Nigeria, the situation in northern Mali and the sporadic attacks in Kenya by al Shabaab as well as the prolonged armed conflict in the Central Africa Republic (CAR), DRC and South Sudan raise serious questions on the AU’s capacity to maintain regional peace and security. The PSC was designed to address crises such as these. Undoubtedly, the AU was set up to step in where the OAU was widely discredited. For instance, article 4(h) empowers the AU ‘to intervene in a member state in grave circumstances, namely war crimes, genocide and crimes against humanity’. Interestingly, at the apex of the conflict in CAR, the African Standby Force was nowhere to be found. Sadly, it was the French troops who were moved to Bangui. Again, the UN had to move its peacekeepers from Ivory Coast, Liberia, Darfur and even Haiti in an attempt to stop massive blood spillage in South Sudan. The African Standby Force was established to provide the military fire power required to respond quickly to such critical situations. 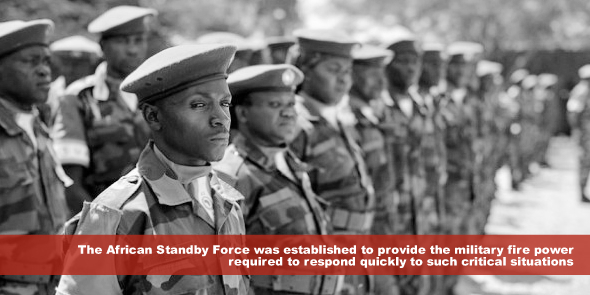 The concept of setting up the Standby Force was conceived in Harare in 1997 by African Chiefs of Defence Staff and received the official go-ahead in 2002. The objective was to guarantee a rapidly deployable military force to respond to crisis situations. The United States contributed US$ 500 million and the United Kingdom provided £51.5 million per year for almost a decade. Despite these support, the Standby Force is struggling to materialise. Differences between African states run far too deep for them to be used in the continent’s many crises. When Ivory Coast and Mali were falling apart it was the former colonial power France that intervened to restore peace. So why this failure? The root of the problem is the AU’s inability to provide effective leadership. Arguably, support and the critical role being played by regional heavyweights such as Nigeria and South African has dwindled over the years. When they held office, Nigeria’s Olusegun Obasanjo and Thabo Mbeki of South Africa worked hand in glove on a range of continental security issues. But the moment has faded. Currently, South Africa is ruled by a weak president obsessed with domestic problems and incapable of giving the continent a sense of direction. Meanwhile, other African leaders spend much money on luxurious cars, mansions and political campaigns to the detriment of providing logistics to their military for the maintenance of national peace and security. The combined effect of these events is the impression that the AU is quickly becoming a toothless bulldog whose policies only remain in theoretical realms. What has happened to the popular mantra, “African solutions to African problems”? Is the AU really positioned to address or lead the initiative to advance and maintain continental peace and security? To lead the challenge to tackle the rising security threats and challenges facing the continent calls for dynamism and timeliness whenever there is an emergency. The rising armed conflicts, terrorist activities and epidemics across the continent require a responsive and proactive regional organisation that can coordinate comprehensive and multidimensional approaches in finding sustainable solutions to the so called African problems. In addition, it is significant that AU member states strengthen their technical and diplomatic cooperation in maintaining continental peace and security. Also, African leaders need to rethink their inaction and the dependence on the West and the international community. The practice of trailing behind Washington DC, Paris, London and Beijing in responding to African crises must stop. They must look within. African leaders must walk the talk to give realistic meaning to the assertion of adopting African solutions to African problems. Michael Addaney is a Corporate Member of the Ghana Institute of Planners (Social Policy option) and a candidate of MPhil in Human Rights and Democratisation in Africa at the Centre for Human Rights, University of Pretoria in South Africa.